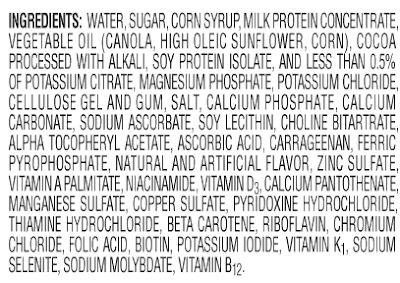 Weighty Matters: Badvertising: Boost - Is it Really "Complete Nutrition"? 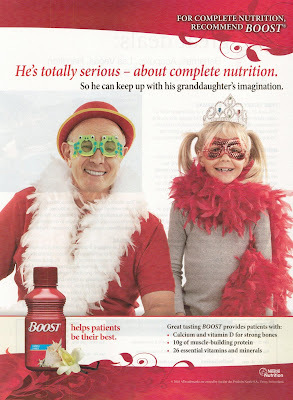 Badvertising: Boost - Is it Really "Complete Nutrition"? You know if you're making health claims and you run your ad often enough, I'll probably get around to checking up on it. Boost. It's made by Nestle Nutrition and they've been advertising like crazy these days with that ad up above being plastered all over multiple Canadian medical journals. and that ad suggests that for said "complete nutrition" I should recommend Boost for my patients. And now let me ask you, if a beverage starts out with a 237ml glass of water and added to that are 7 teaspoons of sugar and corn syrup, would there be any concoction of vitamins or minerals that you could stir into that glass that would have you believe it'd be a smart choice? I didn't think so, and yet with 28g of sugar, and sugar and corn syrup being the 2nd and 3rd ingredients after water, that's exactly what you get with Boost, with added sugar accounting for a whopping 47% of Boost's total calories. So I guess the morale of the story here is that you shouldn't take nutritional recommendations from a clown....or at the very least not from Nestle Nutrition.